A baby swing or a bouncer could be a lifesaver for parents, especially during your child’s first few months. Though nothing can ever replace your loving arms, a bouncer can bring comfort to your little one because of its rhythmic rocking motion. It’s a good way to get you some free time to do other important things like preparing their milk bottles or doing other chores while they are safe and comfy in their swing. You may be wondering why you would need one when they already have a crib, a stroller, and other baby gears. It is not a necessity but it sure is one of the most helpful baby equipment. It provides convenience to the parents and a soothing abode for your baby when your arms need some well-deserved break. Best baby swing we found is the Fisher-Price My Little Snugapuppy Cradle ‘n Swing. It soothes and entertains your little one just the way they like it. You have the option to customize and combine features that your baby likes best. From the swinging motion to the soothing tunes, you are in control. You can adjust the speed to 6 different speed settings to find one that’s most appropriate for your baby and their activity. Set it to low when your little one is asleep and faster when they’re up and about. There are 2 swinging motions to soothe your baby. It can either rock side to side or the traditional head-to-toe. The seat is plush, deep, and cozy. It features 2 recline positions and 3 adjustable seat positions to keep your baby comfy at all times. Baby can face to the side or to the center. Recline it when they’re sleeping or have it in a more upright position when they’re playing. 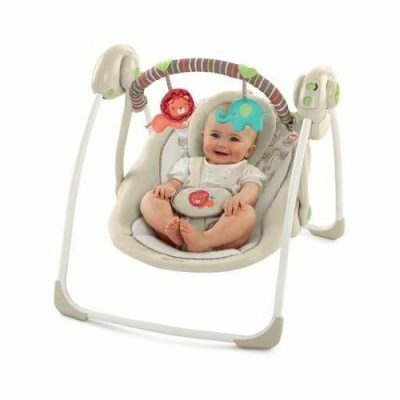 The Fisher-Price My Little Snugapuppy Cradle ‘n Swing features 16 baby tunes to entertain your baby and some soothing nature sounds that have a calming effect. It also includes a motorized mobile with a mirrored globe for self-discovery. There are dancing stuffed animals overhead that encourage eye tracking and a detachable teether toy. This infant swing is powered by the included 120-volt AC adapter. 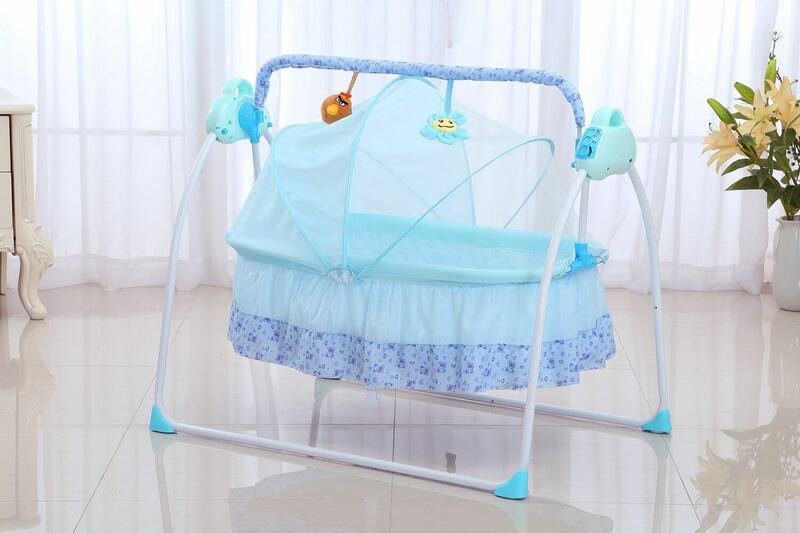 Therefore it is our top baby swing with ac adapter. However it is not portable, so check out our portable baby swing with AC adapter review. It comes in a nice neutral earth tone that would go well with any room décor. Our next choice is the Fisher-Price Papasan Cradle Swing, Mocha Butterfly. It provides cushy comfort as it sways side to side or head to toe. It has a cute pink and brown theme with a dainty canopy, perfect for your little princess. It features two swinging motions. You can set it to rock side to side or the conventional head-to-toe motion. You can also choose from 6 speed settings. These settings can be easily adjusted using the control panel located at the top of the children swing. You will see the dial and the buttons that are easy to understand so you can customize the setting to suit your baby’s needs. The seat is designed with a head support to cradle your baby in cushy comfort. This headrest has side walls to ensure maximum safety for your child. Your baby can listen to 8 delightful songs to keep her entertained. She can grab onto the tray attachment and play with the teething flowers. The pretty canopy sways along with the swing as your little one watches the pink butterflies fluttering and spinning on top of her. When it’s time to sleep, you can play 8 additional lullabies and soothing sounds to make sure she gets to rest well. Turn on the magical light show that projects to the canopy to get her ready for dreamland. This model has two options. It can be powered by four D batteries in battery mode or you can plug it into any standard outlet with the included AC adapter. If you want to save more floor space or if you have a small apartment, the Graco DuetSoothe Swing and Rocker features a great design, emphasizing practicality without sacrificing the comfort and quality. This is for parents that multitask. As the name suggests, the DuetSoothe has a practical design that has two functions. It works as an electronic baby swing and a manual rocker or bouncer. It’s like getting two products. You can remove the seat and set it down on the floor so that it works like a bouncer. This is great if you want to keep your infant close by and have some bonding time. Furthermore, the integrated carry handle makes it easy for you to transport the removable seat anywhere in the house. 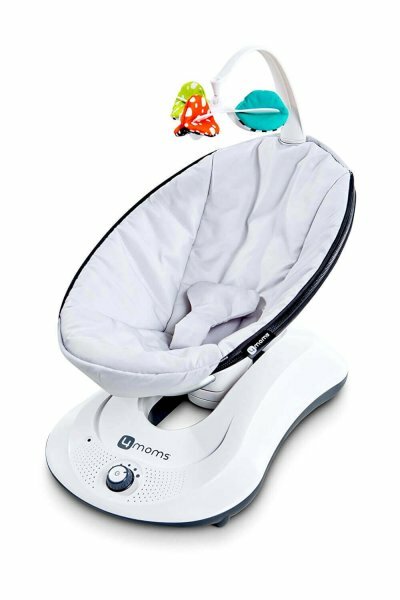 This product features 3 seating positions to match the swaying motion that you choose for your baby. Position your baby however you prefer so that they can sway side to side or front to back. There are 6 speeds to choose from and you can test them to find out which one they like the best. 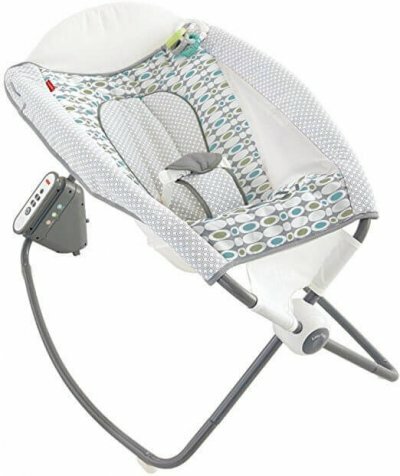 What’s unique about the Graco DuetSoothe Swing and Rocker as compared to other models is that it has a gentle vibration feature to soothe and relax your little one. You can adjust the vibration to 2 speed settings. It has a deep roomy seat so they can move around comfortably. The cozy body support can be adjusted to different recline positions so it can lie all the way down when sleeping or feeding, or sit upright while playing. The seat also features a 5-point harness so your little one is securely seated while using it. Play up to 10 melodies along with soothing nature sounds to keep your baby entertained. This swing set does not come with a lot of attachments and accessories but there is an included little mobile overhead featuring cute little white bears. You can choose from two options for powering it. It can be powered by batteries so you can use it when you’re far from a power source or connect it to a wall outlet with the included cord and plug. The Graco Simple Sway, Abbington has a much simpler design but is not lacking on great features. It is compact and is perfect for small rooms or apartments, and you can keep your baby close by wherever you are in the house since it’s quite portable. 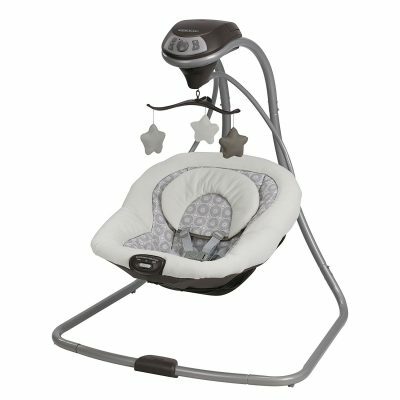 This baby swing features a gentle side to side swaying motion to soothe and comfort your baby. Aside from that, you can turn on the vibration which has 2 speed settings to help keep your child calm and relaxed. The seat has a deep, plush design with a removable infant head support to offer maximum comfort for your little one. It has a built-in 5-point harness to keep your child secure and comfy on their swing. Choose from 10 different songs to amuse your little one and 5 nature sounds to play when they are getting ready to sleep. There are 3 plush toys hanging on the mobile to provide visual stimulation. It helps engage their imagination and keep them entertained. 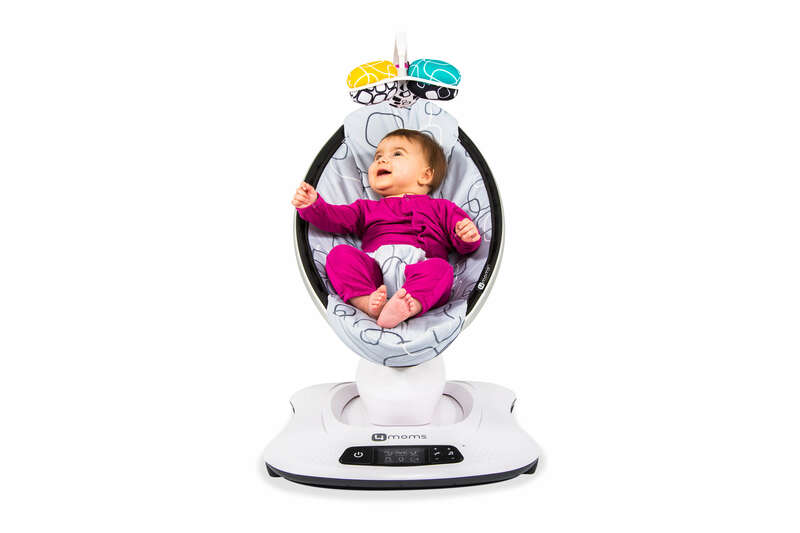 You have the option to plug the baby swing to a power outlet or use batteries when you’re far from a power source. Another practical choice is the Comfort & Harmony Cozy Kingdom Portable Swing. This compact little swing provides all the comfort of a full sized one while being portable and easy to fold and transport. It folds easily and becomes very compact when folded so you can take it along for the ride. It’s perfect when you’re going out of town or visiting relatives, so you always have your handy little swing to keep your baby comfy and happy. It’s small in size your baby will sit comfortably in its plush fabric and removable headrest. There are two recline positions so your baby can lie flat when feeding or sleeping or sit up when it’s time to play. The WhisperQuiet technology ensures there is minimal noise as it swings, to not disturb them while sleeping. 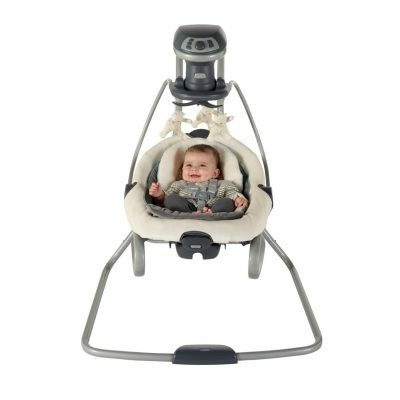 Two great additional features of the Comfort & Harmony Cozy Kingdom Portable Swing are the timer and auto shut-off. You can easily set the amount of swinging time and make it automatically turn off by setting the timer. You can choose from 6 different speed settings to match the activity of the baby. The music volume is also adjustable so you can decrease the volume when it’s time for baby’s nap or put it on max when they want to sing along with the tunes. There are 6 original melodies to play for a baby which also features auto shut-off. The colorful foam toy bar includes two hanging plush toy animals that your little one can play with. This product is powered by batteries. Our TOP choice when it comes to baby rockers. A great place for your baby to sleep in and play in. Suitable for babies which can’t sit yet and with a maximum weight of 25 lbs. This is an automatic rocker that needs to be plugged into an electrical socket. All those comfy rocking motions are just touch of a button away. You can also choose from 2 rocking speeds. The downside is not having a vibration option. The whole rocker is very lightweight. And the best thing is that it folds completely flat! That makes it very easy to transport or to store. With a push of a button, you can activate 12 songs and 3 different sound effects. Awesome for newborns or small babies which love to be rocked all the time! It also comes with a timer which you can set for either 30 minutes or 6 hours. This rocker grows along with your baby. Suitable for infants and toddlers. Automatic rocking! BIG and smooth motion! 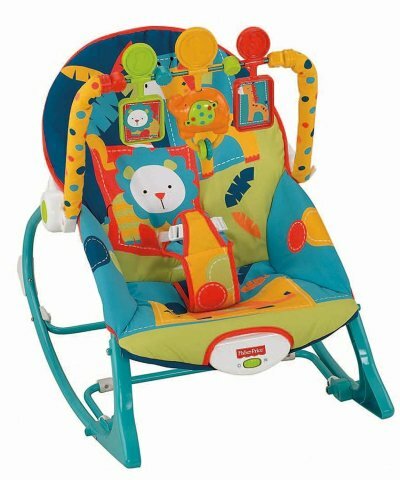 Awesome automatic rocker/swing by 4moms. What’s great about rockaRoo, is the BIG and smooth gliding motion it makes, while the whole rocker has a very small footprint and can be placed virtually anywhere. Another plus is the ability to choose from 5 different rocking/swinging speeds. One funny feature that stands above all other rockers and swings is the ability to connect your own mp3 player or smartphone and play your favorite songs using built in speakers. Seat fabric is easily removable and machine washable. When choosing a baby swing, there are several important factors to consider. To begin with, there are several types. Some are more portable and others have fully loaded entertainment centers. The above-featured models are in the middle range which offers a combination of different features. Here are some of the things to look for when buying one. Consider where you will be using the swing majority of the time. If the location that you have in mind is not near a power outlet, then it’s necessary that you choose a swing that operates with batteries. On the other hand, the ability to plug it into an electrical socket is a more practical choice in the long run. Fortunately, most models now feature versatile power options. A basic baby swing will sway front to back. Some models offer more settings that let your child move side to side, up and down, or in a circular motion. You may not really need all of them. The key is to find out what your child likes best. It’s also a great advantage if you can adjust the speed. Look at how many recline position the seat offers. A full recline feature allows your child to sleep on the swing. The seat must be nicely padded and a removable headrest comes in quite handy. You need to consider the amount of space you have in your house. If you can’t fit a full sized baby swing, there are more compact models that offer just as much comfort and features. Portable swings are also great if your family travels often. A 5-point harness is much safer than 3-point straps. It will keep your baby secure and prevent them from slipping out of the seat. Check if the straps are padded and if they are adjustable. Many swings and bouncers come with accessories and attachments to provide stimulation and entertainment for your child. Some have toy bars, mobiles, and even light shows. Knowing which kind of toys your child is attracted to will help a great deal in deciding which one will work best for them. Almost all of them feature soothing music and nature sounds. Music doesn’t only keep your child entertained but it’s also good for their development.